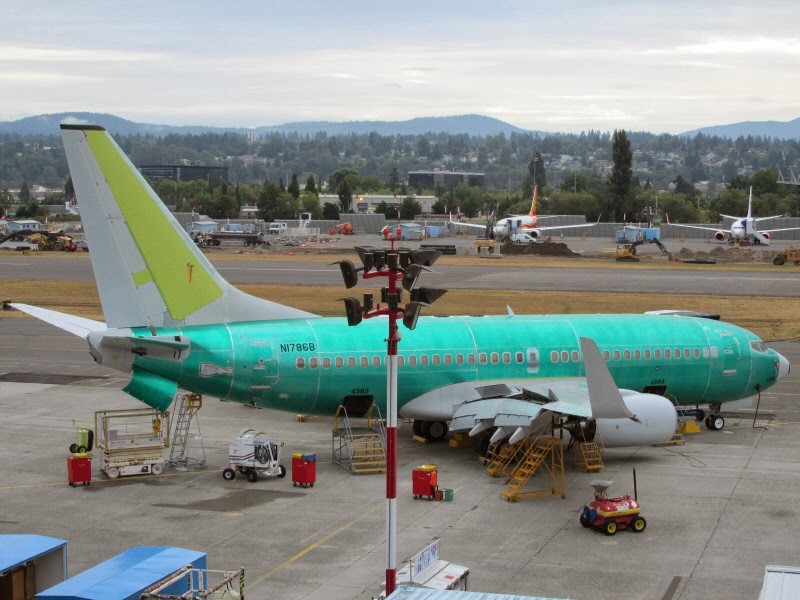 Editorials from Theslowlane: Can pricy Seattle area retain Boeing jobs? Can pricy Seattle area retain Boeing jobs? Overlooking part of Renton assembly plant on my 2013 bicycle tour. Land values and housing costs keep going up in the Seattle area adding to the cost of living. Also the cost of doing business as higher wages are needed to retain a similar standard of living that workers could have for less money in cheaper areas. This is one of the factors that could be pricing Boeing aircraft manufacturing jobs out of the Puget Sound area. Washington State Governor Jay Inslee has recently pushed for a special session of the state legislature to reinstate some big tax breaks for the aerospace industry. To try and assure that the 777 jetliner will be built here. Inslee is fairly left leaning and not likely to be thought of as a proponent of huge tax giveaways to corporations, but Boeing has long been an important locomotive in our local economy. The prospect of those jobs being lost with all their ripple effects through the rest of the economy is frightening to lawmakers and the public alike. The special session was called and the deal sailed through the Legislature only to run into a roadblock set up by the Boeing Machinists Union. Part of the deal called for significant concessions from the union, but rank and file voted 2 to 1 against the pact. Who knows now what the future will bring, but Boeing is looking at other states, such as Utah and South Carolina, to see where the best deals might be. I say it's too bad that tax deals have to be cobbled together like band-aide solutions rather than Washington State automatically being the best place for Boeing. Behind the debate about union or non union, there is a deeper issue of the cost of living. If the cost of living, in Seattle area, was more comparable to other areas, there would be lots of advantage for Boeing to stay. Seattle has it's skilled and educated workforce an well as the years of experience of having Boeing in this area. Lots of local institutions, including institutions funded by state tax revenue, add to the quality of life. I read, in one column, that the proposed Boeing tax deal would have been bigger than state funding for University of Washington. U of W has seen big cuts in the state portion of its funding in recent years. Seattle's prosperous economy has been buoyed up with many corporate entities such as Microsoft and Amazon. Boeing once was the main game in town, but other players could be starting to crowd it out. Lowering the cost of living seems desirable to me, but it isn't an easy thing to do. When housing prices start coming down, affordability should go up, but that's not the only thing to happen. Homeowners become "upside down" in their homes where the mortgages they owe are higher than the current value of the home. It's a difficult situation, as people learned in the 2008 crash. Planning for more affordable lifestyles is very important, but often overlooked in the race for prosperity. Such things as affordable housing, density and transit come to mind along with affordable healthcare. Affordability should be the key to keeping industry in any region, but it's often overlooked. Affordability is a more sustainable solution than the continuing race to the bottom of tax cuts between regions. Planning for affordability isn't just something we should do to be nice to our less fortunate citizens. It's also important in sustaining our economic viability.